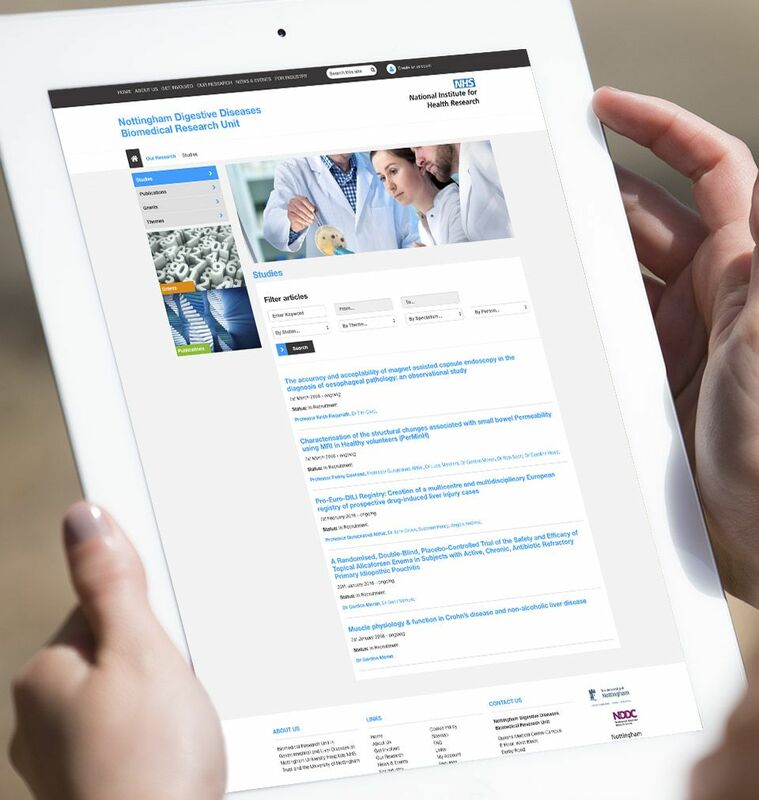 ExpressionEngine created a secure website for the Nottingham Digestive Diseases Biomedical Research Unit. Our client is part of the NHS and we were tasked with building a secure website able to hold vast amounts of sensitive data. As a large enterprise client it was paramount that we adhered to corporate guidelines and carefully liaised with the R&D Information and Engagement Manager from the Department of Health, throughout the design process. The website needed to include lots of content including publications, studies, events and news so we had to choose a platform and design that would display information in a user-friendly way. ExpressionEngine was our chosen platform because it’s very secure and it has the ability to hold large amounts of content. Lots of data and content required careful planning. The website followed a full planning and UX phase to establish how to collate data and cross reference it all from one database. We then created sitemaps, wireframes and responsive designs for nine identified templates. Next came a development process to separate all of the different content types and establish how they would relate to each other via a tagging system. Through careful planning we produced a secure, user-friendly website, protected by a 36 month SSL Certificate. For Phase 2 of the project we developed a bespoke HR system in the backend of the website to hold much more information than is shown on the frontend. This allows different levels of user permissions, allowing varying views of content and reporting. We also added functionality so that members who have team accounts on the site can submit grant, publications and updates to their member team profile page to the site for approval. The submissions are stored in the admin under a pending status and emails are sent out to admin users so they know that a new submission is awaiting approval. The admin can then view the submission, make corrections and either accept (Publish) or reject the submission. ExpressionEngine was our chosen platform because it’s very secure and it has the ability to hold large amounts of content.